Today we have a guest post from Michael Kelley, Content Strategist at Fueled. Michael is a professional tech writer and content strategist with an app development background. He specializes in Android & iOS app design, as well as blockchain & dapp technology. Building a business the right way means making constant adjustments and being one step ahead of the competition. Both large and small companies have found methodical solutions to many of their problems in mobile apps, turning to them to improve business processes in the main line of work and for effective customer communication. Enterprise apps can help companies excel at customer relationships, save time with task automation, manage marketing campaigns, step-up productivity, and boost sales. AI chatbots are the latest trend in enterprise app development that let an app take over the role of a customer service rep and even make simple business decisions for you. Choosing a single mobile feature that will propel your growth is not easy because no business is the same. 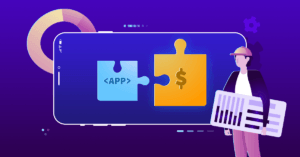 For a particular industry, some features will work better than others but with a little clever thinking, it’s possible to weed out the most important elements of an enterprise app and focus on developing a dominant app – one that will result in a growth boom. Obviously, mobile apps are capable of more now than just a few years back. M-commerce and mobile advertising are getting stronger, bringing new technologies to market and new ways to pay for products. Therefore, it’s no surprise that the demand for enterprise app development is spreading, pushing businesses to adopt at least a few mobile apps on a regular basis. Many go as far as to develop branded enterprise apps and include them in their daily operations as a crucial business tool. Another reason to keep mobile app developers constantly engaged is the increased demand for fast and personalized mobile customer experiences. Business digitization has tapped into customers’ instant gratification traits, making them even more demanding than before. Businesses, clients, and customers are becoming more interconnected in a huge web of mobile devices, creating countless touch points, which provide new possibilities for connection and communication. The need for new mobile apps has never been bigger. No one can deny that offering an impeccable UX to customers is a business imperative. Location-based products and services and smart technology, are changing the scope of the outreach for a business, making it more targeted and more aggressive, while customers are happy to oblige to this new way of doing commerce, looking to get more for their money. But what they are looking for is, above all, excellent customer service, which, apart from a quality product, is the pinnacle of each successful company. If you think about it, all features support an important common element: mobile communication. If you are looking for investment ideas for the next phase of your enterprise app development, here a few more reasons why you need to focus on making it all about communication. Marketplaces bring people together to exchange goods and services. Once only physical, marketplaces got a completely new dimension when the Internet enabled a wider outreach to new customers and supported the development of digital products. The current marketplace lies somewhere between the two worlds. It wraps both of them in a network of unified customer connections to a business. In the language of marketers, this referred to as the omnichannel shopping experience. To forge ahead, an enterprise must consider communicating with its audience via all possible channels. It’s human nature to want attention. Customers like when a company presents a proof of the value provided through amazing customer support. When a business fails to deliver what is expected, a quick response to an inquiry or a well-composed message over the right communication channel can easily remedy the situation. Stronger communication features can help you turn customer support into a product itself, never leaving an unhappy customer’s request hanging in the air. Doing more with less is a key business goal, which underlies many improvement efforts made by companies. It’s logical to expect that enterprise app development will strongly focus on building productivity apps, allowing businesses to concentrate on growth strategies. There are many ways in which an app can increase productivity, including automation, task and project management, as well as collaboration. However, it’s easy to forget that many productivity features are designed with the idea to solve or improve communication issues. Shortened communication lines, no communication glitches, and less effort to reach to the right person are essential to enterprise productivity. With expanding global teams and remote offices, sales reps need a way to do their jobs effectively from various locations. Sales teams need to stay connected to their core business center while also communicating with their team and responding to client’s requests within an acceptable time frame. A communication feature can integrate all aspects of enterprise cross-partner communication, keeping everyone involved and active, and giving priority to the human element of business deals. This is even more important for enterprises that can use communication to nurture relationships with key clients. Another aspect of communication is the social connection of the enterprise workforce. HR experts have always emphasized teamwork and staff morale as critical business drivers. Despite the awareness that a mobile app cannot entirely replace face-to-face communication, in a world where we are hooked to our mobile phones, it’s wise to see how to make apps work for a team, at least on a large scale and in the initial stages of building important business contacts. Communication enterprise apps can be used for global teams, for multiple local offices, for coworking places, and for a single, yet spacious offices. They work everywhere, regardless of team size, serving as the supporting communication structure of small, mid-size, or rapidly growing teams. It’s impossible to solve all the challenges of a business with only one mobile app feature. However, if you are interested in how you can support multiple lines of business just by improving one area, think no further than communication. It’s an aspect of enterprise app development that intertwines with the rest, affecting more areas than initially intended.